Convention and expo badge holders are a common means of preventing name badges or ID cards from being damaged, and facilitates easy identification and access. We provide badge holders to both public and private industries including business, government, military, universities, athletics, meetings, events, conventions, seminars, fundraising groups, and more. Our professional quality badge holders come in a variety of styles and colours. 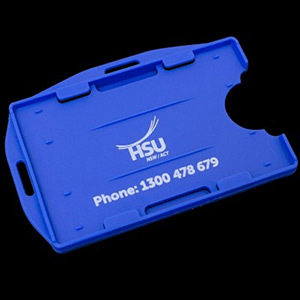 We can supply you with anything from soft or rigid card holders for every day functional use, to clip-on or leather badge holders for a higher-end look and feel. Other options include open and closed face holders as needed. Both horizontal and vertical holders are available and can be provided. Looking for something with more utility? Try using various coloured badge holders to help identify different seniority or departments within your organisation. Do you have specific questions you need answered? Contact us anytime and we will be glad to help. We are always available to answer your questions and help with anything that you need! From proof of nationality to showing credentials, ID cards assist in keeping your personal information organized. As such, custom-made accessories are perfect gifts for delegates and attendees, perfect for events and expos. Stop and shop around our gallery at The Dynamic Gifts to select from the range of items present. It is not uncommon to find faded, scratched, or soiled badges lying around wasted intentionally or lost. Give your cards maximum life to protect your data and support you at all times. You may well ask what it is that makes them special for your clients. The high-quality, durable variety that we offer is modified to include different colours, orientation, shapes as well as flexibility in terms of clarity, proximity, and rigidity. The special ones can be further differentiated with arm bands and ID racks to resist the damage encountered on daily basis. Mark them with your logo, colour code them or imprint with the events name/details. Make them cover the professionalism for your clients in a very cost-effective manner. Available in leather finish, these badge wallets have a clear viewable area and tab for lanyard or a key ring fitment. With minimal weight, the open face ID holders, similarly attached to key-ring, lanyard, wrist strap, or an alligator clip, is available for conference and security teams whereas the closed face holders make for the more rigid types. Another type, clip-on, is ideal for easy survival. Also known as retractable card holders, these become a substitute for the traditional badge carrying and ID accessories especially in places where ID and/or swipe cards are of prime importance. Print either a single or both of its sides in a 1-4 colour logo before using them as gifts. Increasing comfort and coverage with usability, they can, moreover, be used simply as pen, bottle opener, or carabina pullers in customised shapes and colours. We provide products to each customer according to their needs. Printed, designed to work with our complete collection of lanyards, the stock in our showroom at Auckland is open to be explored both for pickup or overnight delivery. Using the latest technology, the most popular lanyard accessory, the printed plastic cards carry vibrant and colour-rich designs that appeals to the individual aesthetic sense and is able to make instant connection for the benefit of your clients. 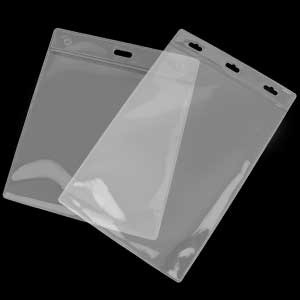 The plastic is dye-cut to meet your specifications of size, shape and moulding besides the printing of graphics, barcodes, magnetic chip fitting, and the sequential numbering before receiving a glossy finish. The luggage cards are the 2-in-1 proposal: have your write-ups prepared to be printed on the back of this eyelet plastic card while the front can carry a full-colour digital printed graphic. Convenient, right? Additionally, the individually-named badges use digital etching technology with data merge type methods to do your brand advertising. You can beat the necessity of keyrings or lanyards by going practical with badge tags. Gift the membership key tags and discover a way to impress all your clients with these colourful graphic printed plastic cards having the barcode application and magnet chips. Alternatively, luggage tags can be preferred in displaying only the name while keeping private details along with the important luggage locked. Talk to us today we can assist with your ID card and accessory needs.